Meridian Passage occurs when a celestial body crosses the observer’s meridian of longitude and at that instant, it will reach its greatest altitude above the observer’s horizon. 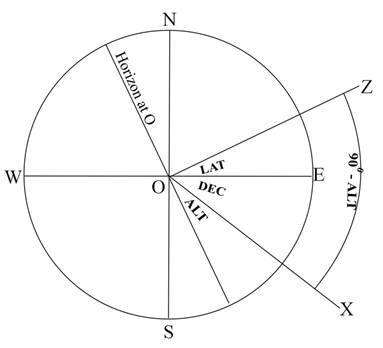 The following diagrams will help to explain how the latitude can be calculated from the Sun’s declination and altitude at Mer. Pas. O represents the position of the observer. X represents the position of the Sun. Z represents the zenith which is an imaginary position exactly above the observer so that OZ is perpendicular to NOS. Angle XOS represents the altitude of the Sun. 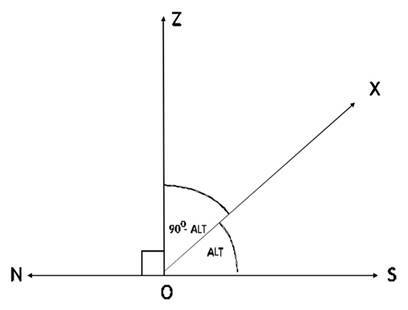 Angle XOZ equals 90o – Altitude. 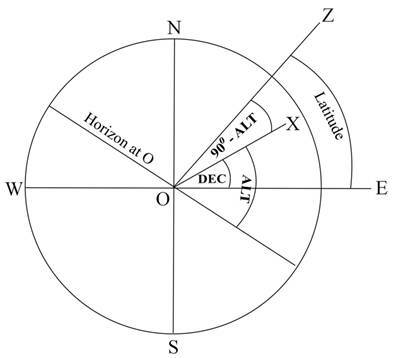 Latitude = Declination + (90o-Altitude). The third case is represented by this diagram. Therefore, Latitude = (90o – Altitude) – Declination. DR Latitude = 320 30’N. In other words, the equation of time is the difference between apparent solar time and mean solar time taken at the same instant at one place. The equation of time can be either positive or negative depending on the time of the year. The values range from approximately +15 to -15 mins. The Equation of Time for 00h (anti-meridian) and 12h (upper meridian) for each day is printed at the foot of the Nautical Almanac daily page as shown in this extract. The Local Mean Time of the Sun’s Meridian Passage is shown in the column to the right of the EOT. (This is the apparent time of Mer Pas adjusted for EOT to give the LMT and rounded up to the nearest minute). If the time of Mer. Pas is shown to be greater than 1200 then the EOT must be positive, if less then negative. To calculate longitude we simply find the difference between LMT of Mer. Pas. and the GMT of our observation of Mer. Pas. then, by converting the time difference to arc we are able to find the difference in degrees of longitude.